Hawthorns, species in the genus Crataegus, are shrubs or small trees, often with two or more trunks, spreading, rounded crowns, and woody spines. Leaves are alternate, simple, toothed, some species having lobes and others not, the leaf shape varying widely (oval, spatula-shaped, triangular, rounded, sharply pointed, etc). Bark is dark and scaled on the trunk, variously grooved, sometimes smooth, flaking. Twigs are usually gray, often hairy when young, often bearing sharp thorns that are about 1½ inches long, often straight or slightly curved. Flowers April–June, borne in clusters, each flower with 5 white petals; stamens 10–20 or more. Flowers resemble small apple blossoms. Fruits September–October, clusters often persisting into winter; like small crabapples; usually rounded and less than ½ inch long; usually red or orange-red, but sometimes yellowish or greenish; fleshy or sometimes dry or mealy; with small seeds within. Some species reach 35 feet in height, while others reach only about 15 or 18 feet. Cockspur thorn (cockspur hawthorn) (Crataegus crus-galli). Green hawthorn (green haw), Crataegus viridis. Late hawthorn (urn-tree hawthorn), Crataegus calpodendron. Red Haw (Downy Hawthorn), Crataegus mollis. Washington thorn (Washington hawthorn) (Crataegus phaenopyrum). Leaves of eight Missouri hawthorns (Crataegus spp.). Common in pastures. Occurs in rocky open woodlands and bluffs, stream borders, thickets, edges of woods, often in rocky places. Some species occur on hillsides, others in bottomlands. The clusters of flowers, often colorful fruits, and manageable size endear hawthorns to landscapers, and many varieties appear in cultivation, including some specially bred for landscape use. In nature, hawthorns are often associated with persimmon, eastern red cedar, Osage orange, red mulberry, and sumac. Hawthorns — members of the genus Crataegus — are found throughout the state; some species are more widespread than others. 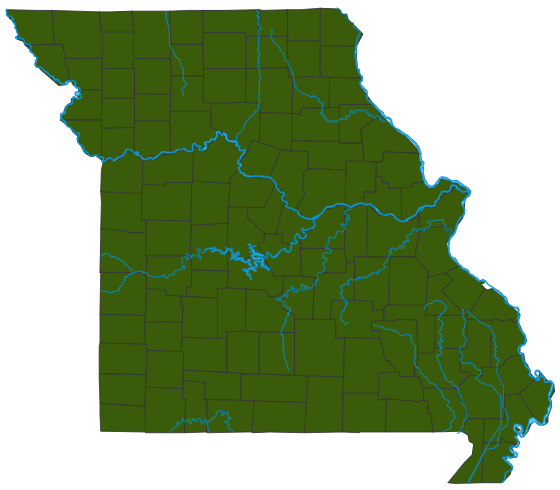 Our state flower, the hawthorn, is solidly represented in Missouri. There are more than 75 different kinds of hawthorns (species, subspecies, and hybrids) that occupy almost every kind of soil in every part of the state. These members of the rose family are closely related to apples. Some hawthorns are common, while others are more rare. Littlehip hawthorn, Crataegus spathulata, is at the northern limit of its range in Missouri and is in danger of extinction within our state. Hawthorns are valuable ornamental trees, and many cultivars have been derived. In 1923, downy hawthorn (Crataegus mollis) was approved as Missouri’s official state flower. Hawthorns have been and are used as a source of medicine. The fruits of some species can be made into jams or tea. The fleshy berries are relished by many kinds of birds, small mammals, and other wildlife. Deer browse on the leaves and twigs. The thorniness, dense branching, and heavy foliage provide important cover for wildlife and nesting sites for birds.